Documents filed in Federal Court last month establish that the City of Branson was not only aware of ownership issues but also negotiated with former Judge Peter Rea to clear title on 37% of the $450 million public/private Lake Taneycomo development known as the Branson Landing. Contrary to testimony presented to the Missouri Southern District Court of Appeals; correspondence from former Branson attorney Lynn Rogers reveals Branson Alderman agreed to settle the dispute with Rea as long as the purchase price was laundered through a third party. "The chain of title in -this case is an absolute mess.' There appears to be nothing but gaps based upon the deeds presented"
Branson's Alderman met with attorneys from Empire District Electric whom filed a quite title lawsuit to clarify ownership. While Branson was working hand-in-hand with Empire District Electric, they planned a maneuver to finagle the land from Empire's hands through adverse possession. The legitimacy of a title of which the city of Branson payed $940,000 was also in question. The $940,000 land purchase helped legitimize Rea's claim. While Branson made a strategic decision to not litigate the matter, gambling on Empire District Electric victory was a costly error. A Taney County jury ruled in favor of Coverdell solidifying Coverdell's property claim. The Missouri Southern District Court of Appeals heard testimony from former Missouri Supreme Court Judge John Holstein who claimed the City of Branson was unaware of the implications of the Taney county jury's verdict in favor of Coverdell. The basis for Empire District Electric's lawsuit was a "scrivner's error" made 100 years ago. Branson's counsel opines the lack of validity to Empire's claims. Holstein not only denied knowledge, but submitted maps created 9 years after the quite title lawsuit was filed. While the lawsuit predates the creation of the Branson Landing by over 4 years; Holstein argued Coverdell's victory would cause insurmountable damage to the City. Empire District Electric clearly had ulterior motive in filing the lawsuit. Victory could mean billions in property losses from Taney County landowners. Empire District Electric hopes two Missouri Supreme Court decisions will be overturned that translates "flooding rights" be interpreted as fee simple tile. Empire District Electric has backed off a policy of notifying property owners on Lake Taneycomo their claims against owners of property on lake since Coverdell's victory. The document posted above was an exhibit filed in U.S Federal Court by the City of Branson against First American Title Insurance, Chicago Title Insurance Company and Fidelity National Title Insurance Company. Over the past few years the City of Branson has taken a conservative position on releasing public documents denying access to invoices paid in clear violation of Missouri's Sunshine Law. Local news outlets have been unable to obtain the billing documents; however, it is believed that billing may ex-cede $1,000,000 for Holstein's "cloud making" services. The City of Branson hopes to recover funds through a title policy whose terms are in dispute. In order to bypass legal controversy over property ownership, the City of Branson worked with Empire District electric creating a new plat map overlaying the property ownership in question. Branson Landing developer HCW Development companies lawsuit against Tri-lakes Title and the company's predecessor were intercepted with the City of Branson moving litigation to a Federal Court. The City of Branson motioned to intervene citing litigation pending in the U.S. District Court Western District of Missouri in Springfield. 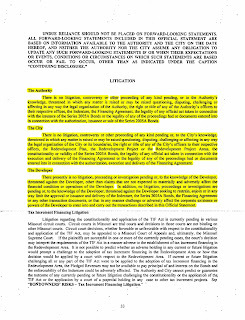 Documents which will be posted before the weekend on http://bransonedge.com paint a damming portrait of the City of Branson's legal activity, collaboration to commit fraud, acknowledgement of title defects and an intimate understanding to minute details involving complications and shortcomings with the Branson Landing project in direct contradiction to statements made by the City of Branson to the press. Branson's mayor currently has a fiscal relationship (business partnership) with the parent company of two local television stations KSPR and KY3 inc. Neither station has reported on the collaborative efforts of Branson, Empire District Electric and HCW to conceal facts regarding litigation in progress during the issuance of Branson Landing 2005A bonds. In fact the opposite is true. 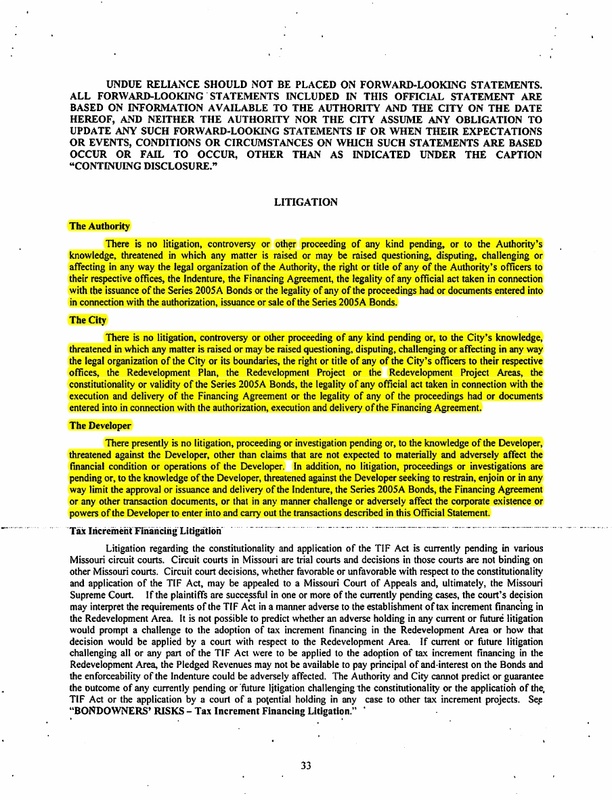 Official documents created to entice investors erroneously claim 37% of the Branson Landing was in litigation at the time the bonds were being offered; In fact, the documents have statements from all three entities denying such encumbrances to fee simple title exist. The misrepresentation's of fact are promoted through the document published below. The false statement that Branson was not involved in litigation at the time, contrary to fact is highlighted on page 33. Branson claims to be the recipient of a title insurance policy which may not exist. In fact, evidence suggests money coughed up by the City of Branson and HCW Development collectively to insure investors in the Branson Landing were protected might not have been utilized to purchase title insurance. The issue may ulitmately be decided by the court. Documents which will be posted soon elaborate on a very shady relationship between the City of Branson and disbarred judge Peter Rea. Rea who was disbarred for sexual misconduct has a son-in-law that serves as an executive for HCW. Former Missouri Supreme Court Judge John Holstein is being retained by the city of Branson at a half price rate ($325 per hour) to defend the city of Branson's interests through post trial activity. Holstein's former law clerk was lead counsel during the time a plan was concocted to obtain property not available through direct chain of title. Holstein's son-in-law Paul Link served as Chief Counsel for the city of Branson through much of the negotiations and completion of the lakefront project. Circumstances suggest Holstein's generosity may result from corrective measures ensuring the safety of both former employee and relative. Such courtesy is not granted to other attorneys working on the case. James Meadows, Jennifer R. Growcock and Jay M. Dade are listed as Branson's counsel for their case against Fidelity Title Insurance Company. Documents produced by the trio elaborate on negotiations with Peter Rea (among other elements) and the City of Branson. Court filings submitted by HCW Development relating to Branson's $450 million riverfront project, popularly known as the Branson Landing, allege damages occurred due to Doug Coverdell's trial victory granting "37.34%" of the Branson Landing to Coverdell and affiliated companies. The accusations posed by HCW Development Company LLC are serious claiming negligence, misrepresentation and/or fraud reached the standard of "Tort". HCW Development is seeking damages for 1. Vexation Refusal 2. Breach of Contract and 3. Negligent Misrepresentation. HCW is seeking a minimum of $25,000 for each charge setting a floor of $75,000 which could elevate to millions as damages outlined in the court petition are calculated. Empire District Electric, The City of Branson and HCW Development claimed the Branson Landing wasn't involved in litigation as they were seeking a third round of funding. The image posted to the left (click to enlarge) is taken from page 33 of the official statement asking investors for $18,560,000. While the City of Branson and Empire District Electric claim ignorance to litigation - they were not only aware but in the case of Empire were mutual aggressors seeking quiet title action to secure the first round of funding.